Who Benefits From the Climbing U.S. Stock Market? I was listening to the radio this weekend and heard some equity market cheerleaders going on about how the melt-up in the stock market lifts almost everybody's fortunes. While I agree that it's important not just for the top 1 percent -- a lot of pension funds and 401(k)'s get a boost from the bull -- the vast majority of the value of the stock market is held by the wealthiest households. I'm sure that's a big "duh" for a lot of readers but the idea that the market lifts all boats is probably more pervasive than you think. The figure below comes from wealth scholar Ed Wolff through EPI's State of Working America (you should really just read their wealth chapter -- one stop shopping for this info). It shows who owns stock market wealth over time. The little smudge at the bottom is the bottom 40 percent of households, and the middle fifth doesn't do much better. 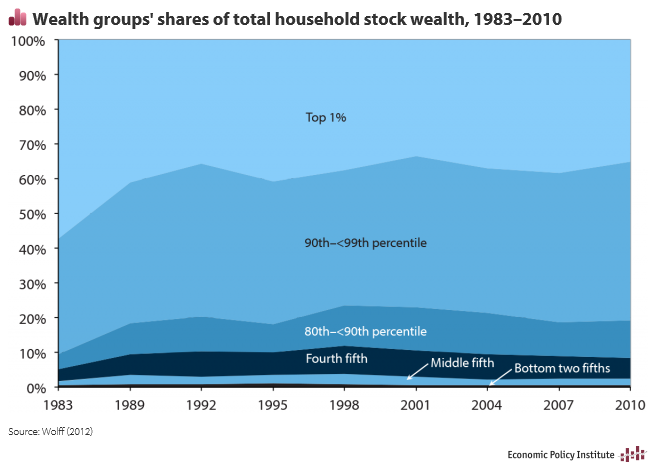 The top 1 percent holds over a third of equity market wealth and the top 10 percent holds about 80 percent. What does that mean in dollar terms? In 2010, according to Wolff's analysis, the stock holdings of the middle fifth were worth about $9,000. The holdings of the top 10 percent were worth $500,000, and those of the top 1 percent: $3.5 million. So how come I had to listen to commentators going on about how 50 percent of households own stocks now, up from 30 percent in the late 1980s? Because they're not talking about stock wealth; they're just talking about shares, with all of that increase coming from retirement accounts. If you own one share or a thousand shares, you're counted the same in that calculation. OK... and like I said, it's true that a lot more people are in the market now. But unless you want to mislead, you've got to be careful to also make the points from the graph below, because your increase in wealth is of course proportional to your holdings. So, go ahead and cheer the climbing market, but don't kid yourself that it's raining down wealth on everybody.